The Samsung F490 is equipped with a 5 megapixel autofocus camera, which produces photos at a maximum resolution of 2592 x 1944 pixels. 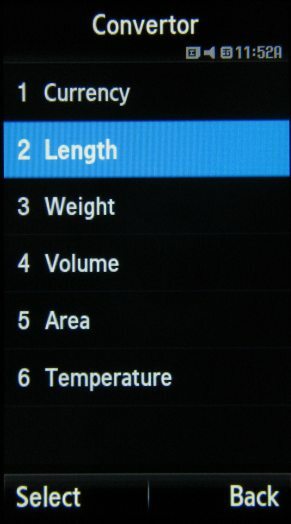 The settings are extensive and include picture size, shooting mode (single shot, multi-shot, mosaic), effects (black and white, sepia, negative), white balance, and viewfinder mode (regular or widescreen). 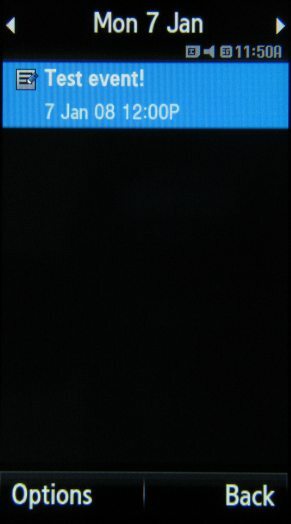 The additional camera settings are accessible from the menu where you can switch between camera and camcorder, as well as turn on the Scene mode. Those settings include stuff like picture quality (normal, fine, superfine), ISO (100-400), exposure metering (matrix, center-weight and spot), shutter sound (can be set to off), zoom sound, brightness sound, default storage memory and default naming of photos. Here are several camera samples from the Samsung F490 and the LG Viewty. The video recording capabilities of the Samsung F490 are pretty modest and nowhere near the LG Viewty skills. The Samsung F490 video recording power maxes out at 15 fps in QVGA resolution. At that resolution, the LG Viewty is capable of taking 120 fps high-speed videos. The Samsung F490 has a web browser that supports both fullscreen and landscape browsing. It even has a mini-map that allows you to navigate over large web pages from a bird's eye view. It's much better in comparison to the Armani phone's web browser, which didn't have full featured navigation of web pages with finger swipes. 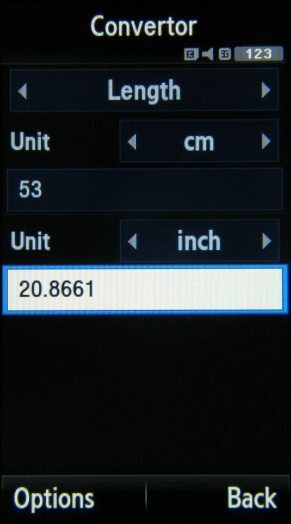 The Samsung F490 allows full navigation with swipes. However it's a bit of a letdown due to the super slow horizontal and vertical scrolling (the LG Viewty had the same disadvantage). The touch operation is nowhere near user-friendly either. Instead of picking the page and dragging it in the direction of choice, you should slide you finger in the direction you want the page to scroll. That's just the opposite of iPhone where browsing pages blends seamlessly with the rest of the UI to give the impression of almost physical interaction as you move things around with your finger. 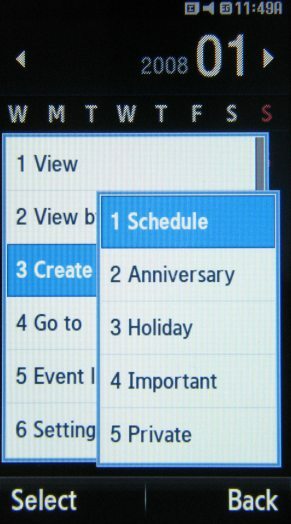 The Samsung F490 calendar offers three views - daily, weekly and monthly. 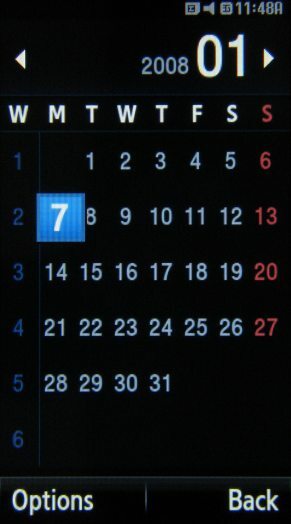 You can choose which calendar view should be default and you can pick the starting day of the week - the options are Monday or Sunday. There are five types of events available for setting up: schedule, anniversary, holiday, important and private. You can store up to 300 schedules, 50 anniversaries, 50 holidays, 20 important, 20 private events. 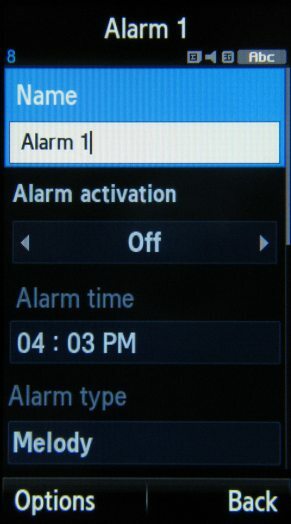 There are five alarm slots, each with a variety of configurable options - snooze time, repetition, etc. 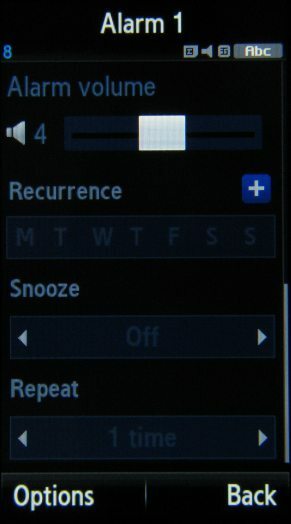 You can of course choose a custom ringtone to wake you up at a preset volume level. 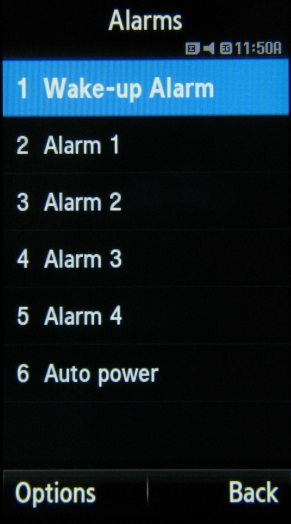 You can also choose whether your phone should automatically power up upon alarm activation. 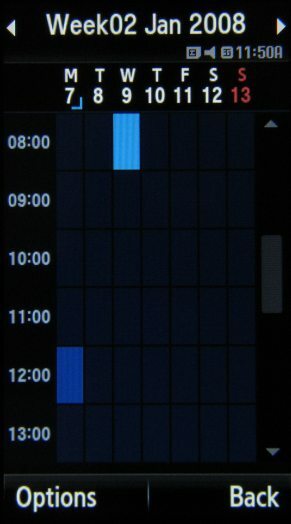 This feature can be quite handy if you have the habit of switching off your handset at night. 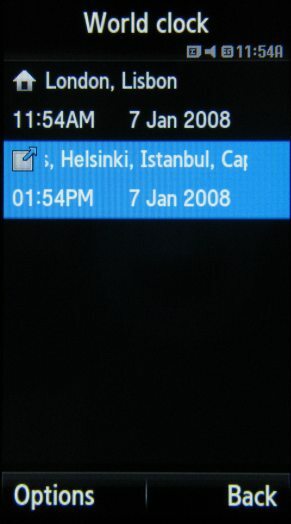 Among the other organizer offerings are a voice recorder, world time application, calculator, and a unit converter. There are also a memo and a to-do application for taking down notes. A countdown timer and a stopwatch are also available. 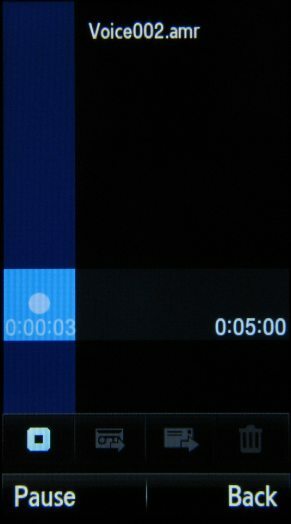 The voice recorder records in .amr format and has a sixty-minute recording limitation like the Armani phone and the F700. 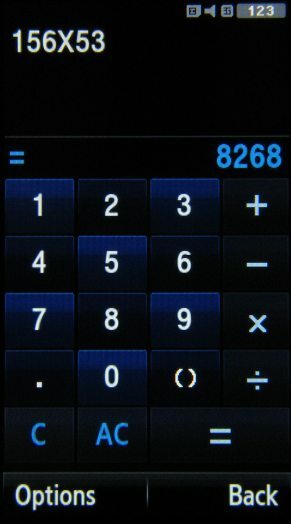 The calculator of the F490 is not as ridiculous as the Armani one. Here you have all your numbers and mathematical symbols on one page. 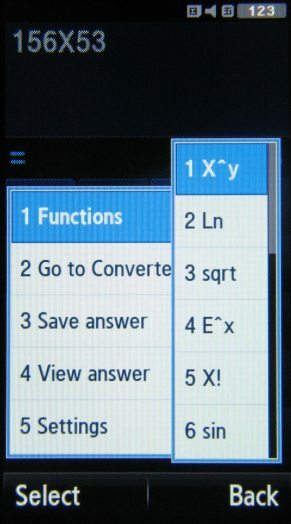 It even supports calculating functions. The Samsung F490 comes with an office documents viewer that supports Word, Excel, Powerpoint and PDF files. 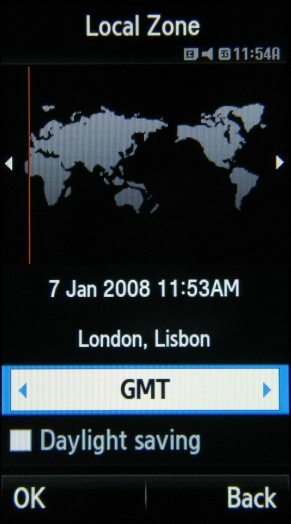 It's no longer a Picsel Viewer but an application by Access, who also develop the NetFront web browser used by both Samsung and Sony Ericsson. The documents viewer is quick enough when opening files, however zooming is again slow. It can also work in landscape mode, which makes reading easier with less panning. Samsung F490 offers excellent Java support as it seems with the three demo Java games that come preinstalled. We are not aware whether those games have been specifically developed for use with such resolution or whether they have been optimized for touch input. The fact is they work flawlessly even if the play field is not stretched fullscreen and they accept touch-based input with no problems whatsoever. "...Well, from our brief experience with the Samsung F490 we are almost sure that this fashionable handset will turn out to be a market success. It offers a great user interface and has all the haute couture style that the LG Viewty lacks...."
In fact we've seen those games run on many of the recent Samsung handsets: Bejeweled, the BlockBreaker deluxe, and Kasparov's Chess.